So, It's New Year's Eve ... Can You Prevent That Hangover? Adam Rogers is a deputy editor for Wired magazine and the author of "Proof: The Science of Booze." He recently sat down with KQED's Danielle Venton to talk about the science of hangovers. And yes, they were at a bar. These questions and answers have been edited for length and clarity. Let's get right to it: Can you take anything before you drink to prevent a hangover? There's nothing anyone has discovered that you can eat before you go out that you can drink as much as you want and not get a hangover. There's one molecule derived from a plant called Hovenia, the oriental raisin, that seems to actually work in people to lessen the effects of alcohol and to lessen the effects of a hangover. Nobody's really done the kind of tests in people to figure out how best to administer it and how it works. There have been other compounds that have shown smaller effects; prickly pear is one. But still, if you have enough alcohol, you're getting a hangover no matter what. Yeah, that's a true thing. Can you prevent a hangover by drinking one type of alcohol over another? Mostly it does not matter what you drink, because it really seems to be a matter of quantity. There is some research that says some alcohols like brown liquors will give you a worse hangover or at least a hangover of a different character than a clear alcohol like gin, or especially vodka, will. Pure vodka is only ethanol and water, with none of the moleclues called congeners that give different liquors various colors, smells and tastes. Some research has shown congeners can make a hangover worse, but nobody knows which congeners or what the mechanism is. But wait. What is a hangover, anyway? Do we know what alcohol does to the body to make you feel like you have the flu? The flu's the right parallel to draw, because the best science that's there now -- and there's not that much of it -- says that a hangover is an inflammatory response. Why it does that, nobody is sure. One of the things people are reasonably sure of is that you start to show signs of a hangover when your blood alcohol level goes back down to zero. It is true that the kind of damage that alcohol inflicts on the liver if you drink a lot over time is inflammatory damage -- when you're on the way to cirrhosis. There's a hypothesis, though it's not well worked out, that a hangover is related to the toxicity of methanol. The alcohol we drink is ethanol, but in some alcoholic drinks there's still a tiny bit of methanol. Methanol messes up the body's ability to metabolize oxygen; when they talk about cheap alcohol making you go blind, they're talking about methanol. But it's a real bummer that there's actually very little scientists understand confidently about what causes hangovers. Of all the psychoactive chemicals that people consume recreationally, alcohol is one of the least understood. People understand marijuana way better than they understand booze. The effects of alcoholism are terrible on society. And it is no fun to have a hangover, but being out with friends, drinking -- we have whiskey in front of us right now -- it's really fun. 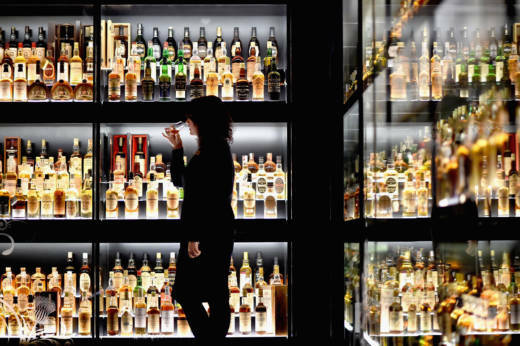 Why are humans so drawn to alcohol? There aren't a lot of ways that people have to chemically modulate their own feelings. When we find one, we tend to glom onto it. People have been consuming alcohol for at least 10,000 years. It might be the reason we started farming, is to have grains so we can make beer as well as bread. So we're talking about the founding of civilization. We are talking about the founding of civilization. There's a Faulkner quote, "Civilization is distillation." And I think he meant it as a metaphor, but I actually like it as more literal-minded. Once you learn how to distill, that's one of the first examples of scientists having a real impact on the universe around us, literally how we feel and how we see things. Any last advice for drinkers on New Year's Eve? To the extent that I would give advice, here it is: Try to remember to drink a glass of water or seltzer in between each drink. You're going to drink, okay, but you want that experience to slow down, because alcohol will screw with your sense of time. Also, the reason you're out having those drinks is for the theater of it, to experience the feelings that the alcohol gives you, and to meet with your friends. You don't want to rush that.